1. Summer isn’t over yet. 2. Dressings aren’t just for salads. Want to take your chicken sandwich or wrap to the next level? Pair it with a great local dressing like Jen’s Gourmet Dressings. They have an out-of-this-world Raspberry Poppy Dressing that has just the right mix of fresh raspberry notes with a nice, tangy tone that will really get you thinking about all the things you should have been using dressing for. 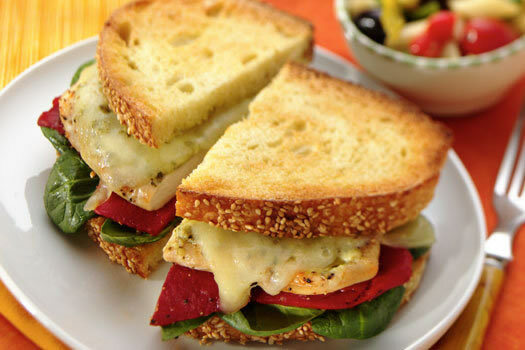 We love to top our chicken sandwiches with sautéed mushrooms and onion, and finish it off with a nice, raw crunch like a chopped red bell pepper to create an even more well-rounded flavor profile. For your next gathering: You could even make mini versions of this for sliders or tiny wraps held together by toothpicks. Everyone will want to know what the secret is. It’s the dressing.